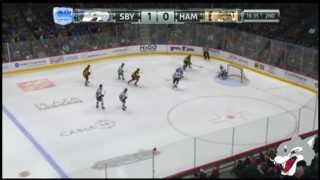 Your Sudbury Wolves had a November to remember, posting a 9-3-0-0 record giving them the Central Division lead as well as putting them in 2nd place in the Eastern Conference heading into December. The pack’s recent success has been built on a balanced team effort that has seen every wolf step up and contribute to the club in their own unique way with a few taking their games to the next level to earn November Player of the Month Award honours. This month’s Molson Canadian 3-Star Player of the Month Award winner is David Levin. 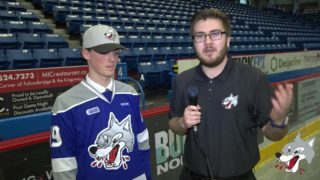 The Wolves forward was named second star in a 4-3 win over the North Bay Battalion on November 2nd and followed that up with a first star performances in a Wolves 3-2 win against the Ottawa 67’s where he notched the game winning goal. On November 16th, Levin picked up 2nd star honours in a 7-1 win over the North Bay Battalion where he notched three points in the victory. On November 30th, Levin notched two pivotal assists in the 3-2 defeat of the Peterborough Petes to cap off a memorable month for #71. The Sudbury Wolves would like to recognize and congratulate David on his excellent play during the month. David Levin was also named the recipient of the TESC Hardest Working Forward of the Month for November. The Tel Aviv, ISR product scored five times and assisted on six others to finish with eleven points in as many games. In his fourth season with the pack, David finds himself in a leadership role with the club. He is counted on every night to produce and pushes his teammates to be their best every day on and off the ice. The Sudbury Wolves would like to congratulate David on his hard work, determination, and leadership that he has brought to the rink every day throughout the season and hope that he continues to have the same drive for success going forward. Cole Candella is the TESC Hardest Working Defenceman of the Month for November. The 20-year old defenceman has been a crucial part to the team’s success this season and really stepped up his game. His three goals and five assists gave him eight points for the month of November and proved to be a big reason the club was able to win some close games. 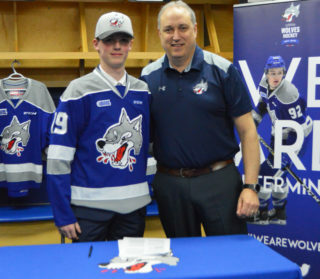 The Sudbury Wolves would like to congratulate Cole on a great month and hope he continues to have the hot hand in the offensive zone as the club heads into December. 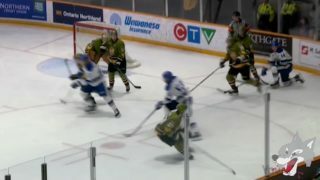 Wolves goaltender, Ukko-Pekka Luukkonen continues to shine in his first OHL season with the Sudbury Wolves. Luukkonen finished the month of November with an 8-2-0-1 record as well as 0.918 save percentage and a 2.55 goals against average. His numbers speak directly to how important he is to the club. The Sudbury Wolves would like to acknowledge Ukko-Pekka for his outstanding performance and dedication this past month once again. Ilderton, ON native, Shane Bulitka, has been named the Wolves United community player of the month for November. Bulitka has been keeping busy when he is not at the rink, recently visiting students at R. L Beattie Public School and Holy Cross Catholic Elementary School. The third-year forward has also participated in skating with fans at the T.M. Davies Arena in Lively. Shane is a leader and a veteran for the club and always looks out for his teammates both on and off the ice. He has a great reputation in the Greater Sudbury community, always signing autographs for fans and taking an interest in being a part of events in the area. 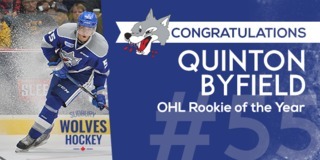 The Sudbury Wolves would like to recognize Shane for his contributions in the Greater Sudbury community and are pleased to have him as a member of our organization. The Reg Wilkinson Men’s Wear Scholastic Player of the Month for November is defenceman Peter Stratis. The 18-year-old Toronto native is currently attending Laurentian University where he is taking two courses. He currently has an 80% average studying: Exercise Science and Psychology. The Sudbury Wolves would like to congratulate Peter on his strong performance on the ice and in the classroom this season. Player of the Month presentations will begin this Friday when the Wolves host the Barrie Colts at 7:05pm. 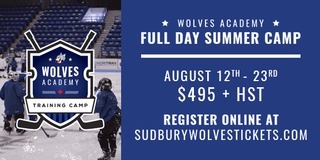 Great seats are still available at sudburywolves.com or greatersudbury.ca/tickets.